El Jardin de Frida Hostel offers shared rooms with communal bathrooms for 200 Pesos a night. You can also get private rooms and/or studios. Quiet, relaxed place to hang out. With a fantastic large central garden area with hammocks, chairs, etc. perfect for relaxing. In house Bar/Restaurant that server’s excellent, healthy food and makes the best Mojitos in town. Simply the best showers (hot water, awesome water pressure) of any hostel in this author's experience. Cabanas Copal Offers shared rooms with communal bathrooms for 20 US dollars a night. You can also get a room with private bath for 75 US dollars and upwards based on the quality of the room and proximity to oceanfront. iTour Mexico, Avenida Coba Crucero Avenida Tulum, Col. Centro C.P., ☎ (0052) 984 80 25 593. iTour Mexico is located at Tulum, Quintana Roo, Mexico. It offers 6 air-conditioned rooms with cable television, Internet, and shower with bath. Some of its offered activities include kiteboarding school and rental, car and bike rental, and massage service. Best rates on official website start at USD 35.00. 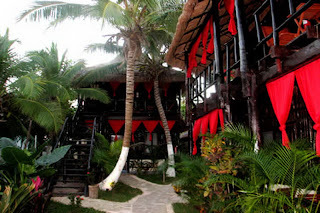 Lobo Inn Recommended only if you are in a real budget (they offer beds for 130 pesos; private double 450 as Feb 2012). Otherwise look for different options; they offer cramped, smelly dorms with equally smelly and cramped bathrooms with cockroaches. However, they offer free use of rather old bikes. 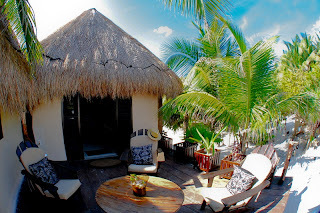 Playa Condesa Offers private cabanas on the waterfront starting at 200 pesos. Located near Diamante K, but considerably cheaper. About 3 kilometers from the ruins. Posada los Mapaches Hostel (0052) 984 871 2700. Bed and Breakfast hostel with new deals for groups, shared bathrooms, delicious breakfast, nice bikes to get around, cozy cabins for maximum 4 or 5 people. Nice place with garden and hammocks. Located on the main highway in front the entrance to Tulum Archaeological site. The Weary Traveler Hostel. 1 block south of the ADO bus station. Relaxed hostel with outdoor communal area and kitchen. Breakfast (DIY), water, cooking facilities, beach shuttle bus and internet provided. A nice place for young people that wants to party. All rooms are facing out to the common area, so lots of noise at night until 11pm. Also not the cleanest place and bed bugs are a common thing. Private rooms in a better state, now situated in a separate building about 200m from the main one, also quieter since avoiding the loud music from the bar at night. Dorm room single beds: 150 pesos with Fan and 175 with A/C. Dorm room double beds: 325 pesos. (200 pesos deposit for blankets, or give your ID as a deposit). Discounts available for stays longer than one night, up to 20% off a 5 night stay. Zamas Hotel. ZAMAS' thatch roof bungalows are right next to the beach. The hotel is 10 minutes from Mayan Ruins, Cenotes (fresh water pools), Sian Ka'an Biosphere Reserve (a UNESCO World Heritag. Hemingway Eco Resort Features 8 rooms on a secluded section of beach about a mile down the road from EcoTulum Resorts. The beach is pristine and the sea is a bit calmer here offering snorkeling right off the beach. Stop by the restaurant for some of the best Italian food out there! Azulik Villas is a series of beachside villas sea-fronting, rustique built specially designed for honeymooners and couples seeking a romantic retreat in the wilderness. It has many relaxation alternatives like different types of massages, esthetic treatments (body and facial scrubs), reiki, the temazcal (copal sweat lodge- is based on traditional healing methods used by indigenous Mexicans to purify the soul and body) and the chamber of flotation. It is clothing optional.